The world is moving to the city. No part of the planet is urbanizing faster than sub-Saharan Africa. The continent’s population of roughly 1.1 billion is expected to double by 2050. 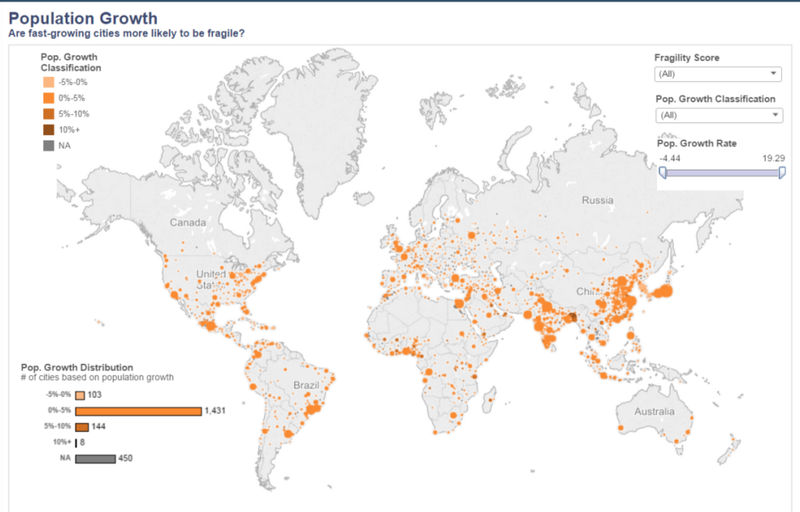 More than 80% of that growth will occur in cities, especially slums. The outcome of this unprecedented urban transition depends on what Africa’s political, business and civic leaders do next. If they take the right steps, innovation, employment and economic growth will follow. If they do not, they can expect poverty, sluggish economies and instability. Many African cities, and thus the continent as a whole, are at a tipping point. Africa is one of the last places on earth to urbanize. There is surprisingly little agreement about whether this is a good or bad thing. Some optimists are convinced that Africa’s cities are the new frontier: sustained population growth will drive economic development, with Africa supplanting China as the world’s manufacturing powerhouse. Pessimists are concerned that the continent’s cities could become overstressed through rapid, unplanned urbanization, generating political, economic and environmental upheaval, and overwhelming countries and possibly regions. Much of Africa’s urban growth has taken place quietly over the past few decades, far from global media headlines. When it comes to the proliferation of cities – especially megacities with populations of 10 million or more – the conversation has been dominated by Asia . After all, there are just three megacities in Africa – Cairo, Kinshasa and Lagos – with a few more expected to join their ranks in the coming decade. But megacities are not the whole story: like urbanization globally, the fastest and most problematic growth in Africa’s urban revolution is occurring in smaller and medium-sized cities. A new fragile cities data visualization identifies 528 African cities with populations over 250,000. The regional urban growth rate is averaging 3.9% a year. But it’s not the size so much as the speed of their growth that matters. The speed and unregulated character of urban growth plays a critical role in predicting the prosperity and stability of cities. Take the case of Antananarivo, capital of Madagascar, which ranks as one of one of Africa’s most fragile cities and whose urban population is growing at 5.1% a year. Abuja and Port Harcourt in Nigeria, cities with high fragility scores, are ticking along at 6.2% and 5.1% respectively. Meanwhile Ouagadougo, capital of Burkina Faso, is experiencing eye-watering population growth of 7.2% while Mbouda in Cameroon is the continent’s fastest growing city at 7.8% annually. Keep in mind that the average global urban population growth rate is currently 1.84% a year. Africa’s turbocharged urbanization is driven by several factors . First, there is what’s called organic population growth, the natural expansion of population due to the surplus of births over deaths, a phenomenon driven, in Africa’s case, by persistently high fertility rates. Second, there is in-migration – both voluntary and involuntary – from rural areas, with locals seeking a better life in the city and leaving poorer, and in some cases war-torn, rural settings behind. Rural-to-urban migration is driven by both pull and push factors. Pull factors draw rural populations into the city and include economic opportunities, employment, better connectivity, access to essential services and education. Push factors drive people out of rural environments, and include rural conflict, environmental degradation, climate change and resource shortages. These factors can work together to create a vicious cycle, where poor rural conditions are exacerbated by a brain drain as people leave the countryside looking for a better life in town. Third, labour migration and new forms of connectivity are driving migration across borders, stimulating booms in some cities while draining others of human capital. This is especially true in Africa, which has seen some of the fastest growth in connectivity since the turn of the century. In the year 2000, for example, there were only 30,000 cellphones in the whole of Nigeria; by 2012 there were 113 million. The blistering pace of urbanization, combined with the so-called youth bulge – especially the high proportion of young people with few job prospects – is a major risk factor for instability. Africa’s youth population (15-24) is growing faster than any other region. About 70% of the continent is under 30 , and this figure rises even higher in so-called fragile settings. Young people account for about 20% of the population, 40% of the workforce and 60% of the unemployed. While offering a potential demographic dividend, the youth bulge is also a formidable challenge and potentially destabilizing factor for cities across the region. Put all these factors together, and many cities across Africa are suffering from a combustible mix of risks. It is difficult to know the extent of urban insecurity since data coverage and quality is exceedingly weak. For example, only a handful of cities – most of them located in Ghana, Nigeria, Kenya and South Africa – publicly report their homicide rates. Another way to understand insecurity is by applying big data monitoring systems to track political and social violence reported on a daily basis across hundreds of media outlets. Using this method, cities like Kano, Gombe, Jos, Okene and Zaria in Nigeria report violence rates that are off the charts. Ditto with Kismayo, Merca and Mogadishu in Somalia. Meanwhile, lesser known cities like Huambo (Angola), Bukavu (Democratic Republic of Congo), Bujumbura (Burundi), Sekondi (Ghana), and Durban and Kempton Park (South Africa) are also at risk. The news is not all doom and gloom. There is much resilience in African cities – resilience defined, in this case, by the adaptive resources that a city and its people can unlock to deal with the pressures of rapid urban growth. Urban resilience is embedded in the informality of a city’s institutions and the ingenuity of its residents. And African cities are nothing if not dynamic. The good news is that African cities are not standing still. Urban authorities in centres like Narok and Kisumu in Kenya, and Moshi in Tanzania are investing in improved risk assessment, urban upgrading, smarter land use and plans to strengthen environmental protection. Major cities like Accra (Ghana), Arusha (Tanzania), Enugu (Nigeria) and of course Kigali are also doubling down on resilience, including in partnership with the 100 Resilient Cities Initiative. There is still time to seize Africa’s urban advantage. Using history as a guide, urbanization typically brings an economic dividend. It frequently translates into improved living standards and wellbeing in the medium to long term. Rapid population growth and expanding youth populations don’t have to impede Africa’s progress. Nor will meaningful urban development occur spontaneously. Smart, inclusive, long-range planning is required. New forms of devolved governance are warranted, including greater power for mayors and municipal governments, and more participative involvement of civil society groups and city populations. A continental conversation is needed about the state of Africa’s cities. If the continent’s urban advantage is not properly seized, it could lead to a new era of urban fragility. Robert Muggah is the research director of the Igarapé Institute and the SecDev Foundation . He is a member of the Global Agenda Council on Fragility, Violence and Conflict and is working with the United Nations University and other organizations on a project mapping fragility and resilience in cities. David Kilcullen is founder and chairman of Caerus Global Solutions and First Mile Geo. He previously served 25 years as an army officer, diplomat and policy advisor for the Australian and United States governments in the Middle East, Southeast Asia and Europe.